Take a look at this Jollbot video for a better look at its unique rolling jumping gait. The proposed devices would have a soccer ball-style surface, with hexagonal solar panels gathering energy. A pretty cool DIY project by Nils Völker done with a Lego Mindstorms NXT robot kit. ...we employ soft actuators to controllably deform a robot body, enabling it to crawl and jump on rough terrain. Take a look as OrbSwarm bots roll around. GroundBot weighs just 25 kilograms and rolls easily on its special polycarbonate shell. "From the patent photos, I was expecting the Omnidroid from The Incredibles." 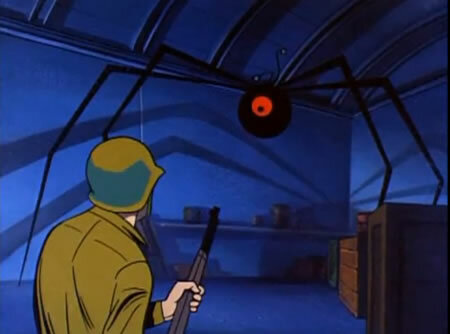 "Actually, I was reminded more of the Robot Spy from the old Jonny Quest cartoon. http://davidszondy.com/future/jonny_quest/robot_spy.htm"
"Holy crap. Who knew that supervillains and arch nemeses need to take out patents! I guess it would be a pain to be sued while trying to take over the world. I found some video, will add to the article. Jonny Quest was one of my favorites; my son likes it, too. The Robot Spy is one of my favorite episodes. Thanks!" "Guard! Get tanks, flamethrowers - anything! That thing must be stopped!" I also added the Omnidroid 08 robot from The Incredibles; thanks, readers, for helping me improve my article." "@ Bill, It is USA that wants to monopolize its hegemony unlike China whose intention currently exists in wild western imagination." Back on topic, I think that the choice of Dr. Zin as a villain had more to do with the Jonny Quest program's fascination with exotic locales than anything else."